During a day of skiing in the resort of Tignes, do not miss the opportunity to do this bungee jump on a ski jump. Come discover this world novelty ! In skiing, surfing or tobogganing, dare throwing yourself into the void ! 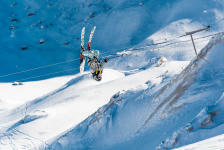 During a skiing day in the station of Tignes, don't miss the opportunity to try a skiing bungee jump ; a worldwide first ! With skis, surf or a sled, offer yourself a strong adrenaline boost!